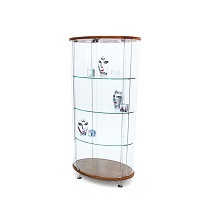 The Showcase curio cabinet is the ideal place to display and store your mementos, valuables, curios, art, and valued trinkets. The cabinet has built-in LED lightubg to illuminate the four glass shelves. The cabinet locks to ensure the safety of the valuables inside. Available in a smaller model, as well as in additional base colors.